Why should anyone in their right mind pay good money for a console port of a game you can play on a PC, right now, for free? Auditorium HD is a console port of Auditorium, a PC game put out in 2009 that was itself a bulked-up version of a Flash-based puzzle and music title first released in 2008. There wasn't much to it then - you guide a "flow" of music through a series of bars that need to be filled up - and now, two years later, there's still not much to it, the extra levels added for the game's first commercial release now added to again with a second "campaign" extending the game's lifespan. The late-night adult gamer who after an evening spent elsewhere, doing other things, wants nothing more than to retire to their room and play a gentle game about gentle music. 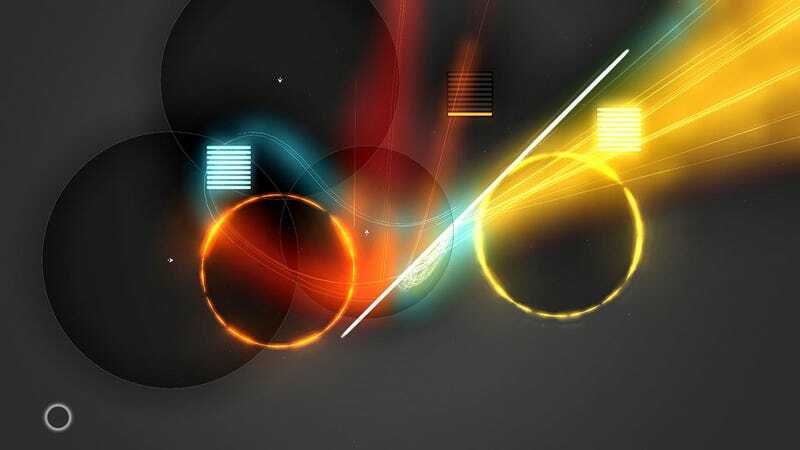 The PlayStation 3 may be home to several "chilled" games of this nature, but while other games like Pixeljunk Eden and flOw are mostly about relaxing, Auditorium HD lulls you into a trance with one hand while covertly taxing your higher brain functions with the other. Why should I buy this if I can play the Flash version for free? Good question. While there's little in terms of design or mechanics you'll get outside of the free version available on the game's site, its a question of scale. The free game is small. The PC version you can pay $10 for, at 15 songs (each with numerous states inside) is bigger. This one is bigger still, adding a whole new set of songs and levels that relegates the original retail release to the status of a campaign. If you play the Flash version and love it, look at the commercial releases as the main meal to the free version's entrée. How tough is the game? Oh man. It's tough. On the one hand, Auditorium can be very forgiving in some levels, as there's no single, definite "answer" to solving a puzzle. You just need to be close enough to the general idea and you'll pass. On more difficult stages, however, this can be a problem, as you can be very close to solving a puzzle and not know it, since you're left endlessly tinkering with things until it all comes together. It can be incredibly frustrating to clear one stage in five minutes then be stuck on the next for over an hour. So what's the music like? For a game based around the flow of music, whether you dig the tunes or not is obviously important. I liked it - it's a non-stop collection of sweeping yet simple orchestral stuff - but if you were hoping for boppy dance beats or other more up-tempo fare, sorry, this isn't the game for you. One thing that saddened me was that, having grown to really dig the game's music, there was no way to listen to it outside of a stage; the game could really have done with at least an in-menu jukebox for all its songs. There are times when Auditorium HD's roots as a free Flash game show; when you quickly see most of what the game's going to show you, when you realise you'll be doing the same single thing over and over for hours and when you realise the game's intro sequence has been ported over unimproved, looking decidedly "un-HD" in the process. But then, Auditorium prospered as a Flash game for a reason: its mechanics and premise may have been simple, but they were beautiful, and they were fun. Auditorium HD simply takes those positives and gives you a lot more of them, making it not just the definitive version of the game, but one of the better titles of this ilk on the PlayStation 3. Auditorium was developed by Cipher Prime and published by indiePub for the PlayStation 3 (version played) and PSP, released on November 23. Retails for $10. A copy of the game was given to us by the publisher for reviewing purposes. Played Auditorium Classic to completion.